Three Bedroom Villa with private pool overlooking the Island of Ithaca. Truly breathtaking sea views set in the peaceful hamlet of Tselendata a two kilometre drive to the very pretty harbour village of Fiskardo, where you can watch the boats come and go while enjoying a drink or meal. A short walk from the villa brings you to Foki beach a beautiful olive fringed bay with a traditional taverna and crystal clear water. Really enjoyed our stay in this lovely villa we would come again. Fantastic villa in a wonderful location with incredible views across the sea to Ithaca. Villa Pelagia is a fantastic villa in a wonderful location nestled in a little hamlet amongst other villas so as not to feel isolated. It is above a country lane but it didn’t affect our relaxation at all. 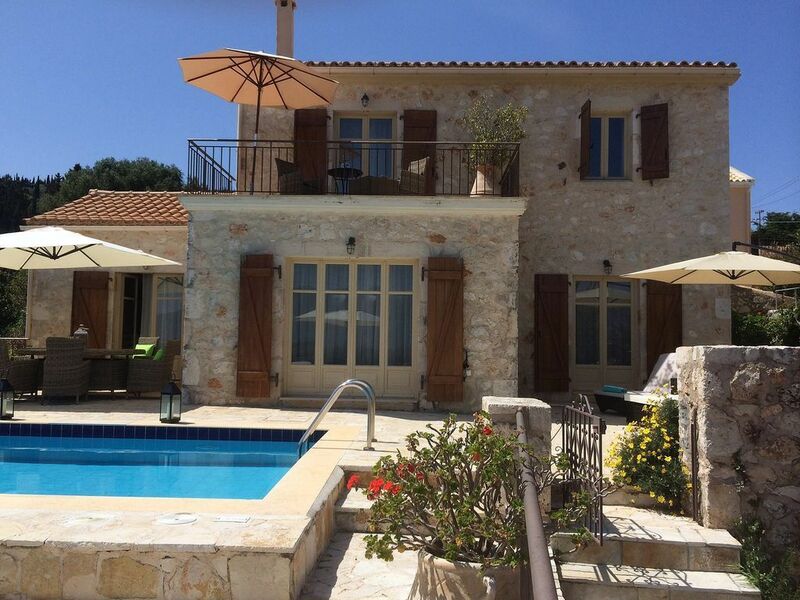 The highlight of the villa is it’s prime location overlooking the sea and out to Ithaca. A delightful pool to enjoy with the family, staying in the sun until early evening. Our favourite part of the villa is the balcony where you can eat breakfast taking in THAT view! A short drive to Fiskardo with its wonderful harbour and amazing restaurants. Ellis is well worth a visit, as is the old stone house at Antipata. We will definately return. We really enjoyed our stay at Villa Pelagia. It's in a great location with good privacy and a lovely view over to Ithaka. The pool was perfect, clean and fresh with the pool man coming twice during the week as did the cleaners. The beds were comfy and the air conditioning was just what's needed for a good night's sleep. Directions to the villa were very clear but a warning about the steep ramp into the driveway would have been useful. There were a few minor things which would have made our stay even better. There was no welcome pack ... useful if you have a late arrival and guest book was full with no space for our comments. We were surprised that the showers were mounted so low, meaning you had to either crouch down or hold the nozzle to wash your hair. There was no information about what to do with recycling, though it was easy to know where to put rubbish with all the large bins at the side of the road. It was good to have a cool box but, as the handle was broken, it could only be carrried by holding it at the bottom. Many thanks for your feedback. I will pass this these onto the villa owner and ask for them to be actioned. I am so pleased you had a good break at Villa Pelagia. Villa has lovely views of Ithaca, especially from the main bedroom terrace. It's very spacious with three double sized and comfortable bedrooms, has a large well equipped kitchen and comfortable sitting room. The poolside equipment seemed new and the large table and chairs were more than adequate for six. Things to be aware of:- If you're allergic to cats watch out, there's a clowder of them, they're cheeky and they sneak in to the villa. The pool depth is 1.2m at the shallowest so be careful with the little ones. Fiskardo Quay is a 3km walk, although the little bar/taverna at Foki beach is about half that distance. I wouldn't stay here without a car personally. Whilst there is a large bougainvillea separating the villa next door it's not completely private if that's what you're looking for. The price in early June was good value compared to other villas we've stayed in and is definitely more affordable than the highly overpriced apartments in Fiskardo. Finally a welcome pack would have been nice to get us going, maybe with some water in the fridge. It would also have been useful to have a few washing machine and dishwasher tablets, even some washing up liquid. I'm basing this on the villa we stayed in the previous week in Trapezaki. Many thanks for your feedback. I will suggest this to the villa owners. Lovely spacious villa. Excellent outdoor area and pool. Perfect base to explore the Island. Amazing views and a homely feel to the villa. Car hire is a must as the villas location is in a quiet road away from the main tourist areas. The wasps are a nuisance but unavoidable as they are all over the island. Restaurants offer burning coffee pots to help out at meal times. Yes there are cats but every Greek island we have visited are the same, not a problem. The only negative is the outside cushions are in a poor state and there are areas in the villa that could do with a little tlc all of which have been mentioned in the guest book and on review sites. On the whole a lovely little villa relaxing and peaceful. Thanks for sharing your holiday home.